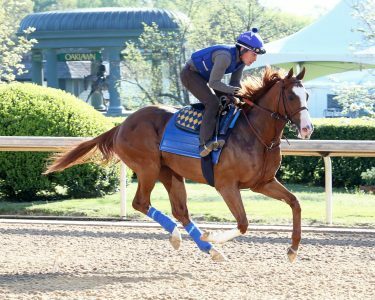 Improbable has been made the 8-5 morning line favorite in Saturday’s Arkansas Derby at Oaklawn Park (photo via Oaklawn Park). Each year, the $1 million Arkansas Derby (G1) marks the end of yet another grueling Road to the Kentucky Derby (GI) journey and, as such, it’s often the most anticipated prep of them all — as well as one of the most productive in producing Derby winners. Triple Crown winner American Pharoah used the Hot Springs Derby prep as a springboard to racing immortality in 2015 and, this year, 11 will line up to race the 1 1/8 miles over the Oaklawn Park oval. The final 170 points will be awarded to the top-four finishers (on a 100-40-20-10 scale), a win guaranteeing a spot in the Derby gate while a placing for several with points already in the bank having a big say for crossing the bubble from “out” to “in” on the list of 20. Several who have been considered top Kentucky Derby contenders all season, but for one reason or another were unable to earn points, have a lot to lose with a poor showing on Saturday. Even though the Arkansas Derby has only produced six Kentucky Derby winners overall, three of those came from the 47 Arkansas Derby entrants to make the Run for the Roses since 2004, according to statistics kept by US Racing’s Derek Simon. In addition to winners American Pharoah, Smarty Jones and Sunny’s Halo, other big-time names have taken the southern path to Triple Crown race success, including Elocutionist, Temperence Hill, Tank’s Prospect, Pine Bluff, Lil E. Tee, Victory Gallop, Afleet Alex, Super Saver and Creator, not to mention a half-dozen other classic-placed runners in the more recent history of the race. The weather for the Hot Springs area on Saturday is expected to be much cooler than the 70s of earlier in the week, but still warm, with a high near 60. Unfortunately, the forecast calls for thunderstorms and the potential for heavy rain all day. The D. Wayne Lukas-trained filly Althea defeated males in 1984 in a final time of 1:46.80, which remains the fastest Arkansas Derby in its 73-year history. 1. Improbable – This City Zip colt, who bears a striking resemblance to last year’s Triple Crown winner Justify (not just physically, but also in that they sport the same connections), currently owns 25 points, thanks to a runner-up finish in a division of the Rebel Stakes (GII) and needs to at least finish second to make the Derby gate. He had some trouble in the Rebel effort and was only beaten a neck. 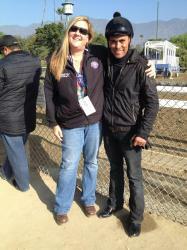 He’s been training forwardly at Santa Anita since and is the 8-5 favorite here. Trainer Bob Baffert didn’t seem too thrilled about the innermost post position. 2. Six Shooter – This former $20,000 claimer has one point and would likely need to win to make the gate for the Derby. He’s a local horse, trained by Paul Holthus, whose father trained 2006 Arkansas Derby winner Lawyer Ron, but he’s struggled even in non-graded stakes — though he did win a little listed event at Delta Downs in January. Jockey David Cohen hasn’t won an Arkansas Derby yet. 3. Omaha Beach – The Richard Mandella-trained Rebel Stakes (GII) winner returns to the scene of the crime off of his impressive nose victory over Game Winner in what was his stakes debut and this son of War Front has Mike Smith back to ride looking for his second win in the Arkansas Derby and his first since Bodemeiser in 2012. The Fox Hill Farm colorbearer is the second choice at 2-1. 4. Tikhvin Flew – In three career races, his two stakes appearances produced a third in a non-graded event at Aquduct and a well-beaten 10th in the Gotham Stakes (GII). This is the first start outside of New York for the Steve Asmussen-trained son of Street Sense, but he’s 30-1 for a reason. Asmussen won this race with Private Emblem in 2002, Curlin in 2007 and Creator in 2016, but Tyler Baze has yet to win this race. 5. Laughing Fox – was soundly defeated in one of the divisions of the Rebel last time out but returns hoping for a better outcome, as one of Asmussen’s four runners here. Ricardo Santana Jr. was aboard for a win (with Asmussen) in 2016, but this colt seems in tough if they expect a win. 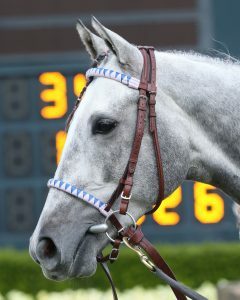 Gray Attempt (photo via Oaklawn Park). 6. Gray Attempt – Back on the Derby trail after a very poor 11th and last-place finish in the Southwest Stakes (GIII), this Jinx Fires-trained son of Graydar came back with a nice 3 ½-length win in the Gazebo Stakes three weeks ago. He earned 10 Derby points when he won the Smarty Jones at a mile in January and he needs to finish at least second here, but this need-the-lead type has some serious distance questions hanging over his head. Jockey Stewart Elliott, who was aboard Smarty Jones for his 2004 campaign, is aboard for this race. 7. Galilean – This California invader also returns after running in the Rebel last out, finishing third behind Long Range Toddy in the first division. The Cal-bred Jerry Hollendorfer trainee needs a win to make the gate in the Derby. The $600,000 son of Uncle Mo, who is owned by the partnership of West Point Thoroughbreds, Denise Baker and William Sandbrook, has excelled in state-bred company, but it remains to be seen if he can compete at this level and especially at this distance. Flavien Prat rides looking for his first Arkansas Derby win. 8. Country House – This Boll Mott trainee has been knocking on the Derby door all meet, picking up 30 points with his Risen Star Stakes (GII) runner-up finish and Louisiana Derby (GII) fourth last out. With one exception, he’s consistent and, with 30 points, even a third-place showing may push him past the bubble. This son of Lookin at Lucky will have Joel Rosario aboard for the first time looking for his first win in the Arkansas Derby, just like his Hall of Fame trainer. 9. One Flew South – makes his second start for trainer Doug O’Neill off a flat fifth in the Mine That Bird Derby at Sunland Park back in February. He’s well traveled, even though he’s raced at only two tracks (Turfway Park and Sunland Park) with works at Fair Grounds, Santa Anita and, now, Oaklawn Park. The Giant’s Causeway colt has a tough task under Calvin Borel, despite the fact the jockey is in the Hall of Fame and won this race in 1993 on Rockamundo and has visited the Kentucky Derby winner’s circle three times. 10. Jersey Agenda – Asmussen’s third runner, this son of Jersey Town has been ineffective in two starts in graded stakes company, finishing eighth in the Southwest and fifth in the Rebel, both times ten lengths behind the winner. Ramon Vazquez rides. 11. Long Range Toddy – This Rebel Stakes division winner is 5-1 on the morning line despite coming close all winter, finishing second in the Smarty Jones Stakes and third in the Southwest before his latest win. He has 53 ½ points already and is probably safely in the Derby gate, but his connections — including Asmussen — are probably hoping to pad the total a little bit. Jockey Jon Court, who could have ridden Gray Attempt, won this race in 2010 with Line of David and in 2011 with Archarcharch.